As the crowd gradually poured into the Bi-Lo Center nearly filling up the arena I began feeling surprised that an act like this would have this much appeal in a medium sized city in the south. As the show got going it became easier and easier to understand why. The show opener was Mike Relm, a small guy dressed in a black suit with a black tie. He had a turntable with beats, songs, and video programmed in from his Apple i-Book. He took popular songs and beats and transformed them into completely new experiences by mixing, looping and scratching with his turntable. The highlight of which was probably the rousing Zeppelin track, “Immigrant Song.” Relm performed his mixing magic for about 30 minutes, and it was a perfect warm-up for Blue Man Group. 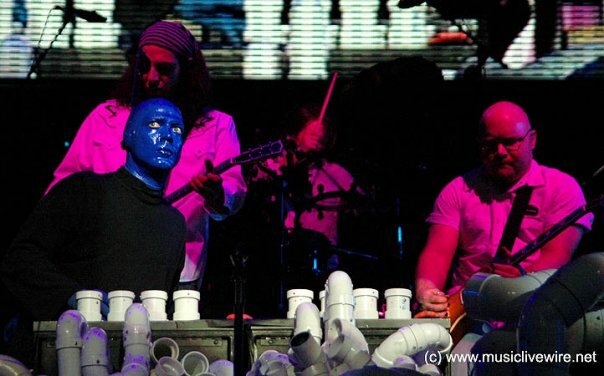 The Blue Man Group performance started behind a large white sheet with a strobe light reflecting against it. The shadows of the Blue Men coming through began to play on their amazingly complex PVC giant of a percussion instrument. As the beat grew more and more complex building up to its apex, the curtain dropped, and the huge band behind joined in taking the already intricate percussion progression to a whole new level. The mix of the music and the theatrics of the Blue Men as they pound away really produces an energy level that is unprecedented at 95% of other rock shows. In my years of going to shows and seeing hundreds of acts I’ve never seen a band quite like this in terms of skill and size. It consisted, throughout the entire show, of a kit drummer, two stand up percussionists with a huge range of mids and cymbals, two guitar players, a bass player, a keyboard player, and a lovely female lead singer. All of this along with the Blue Men doing their thing to keep the crowd laughing and entertained translated into quite a powerful experience. Mike Relm, the opener, even joined in for a while with his turntable. The theme of the show was “How to be a Megastar.” They obtained a mail order video manual for $1000, which was charged to someone in the audience (nice gag), it and went through the cliched steps of portraying an enthusiastic rock and roller from the fist pump to the rock “clown” horns salute. The songs ranged from choice covers like Devo’s “Whip It” and Donna Summer’s “I Feel Love” to some very well written and performed original songs. My favorite of which was a 9/11 tribute that was very melodic and haunting. The highlight of the show for me was their remarkable cover of The Who’s “Baba O’Riley”, which brought the crowd to its feet. I had heard the Blue Man Group was something you had to experience in order to understand, something you had to see to believe. Indeed if you were trying to tell someone, “yeah, these three blue guys play an instrument made out of PVC”, it would obviously be a bit of a hard sell. I challenge any skeptics to go to this show, and try to tell me it wasn’t worth your time and money. This was easily one of the best shows I’ve ever been to, and I can only hope to be able to experience it again.